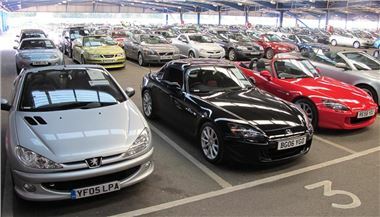 Lex Autolease and BCA will stage a unique double convertible sale on Saturday March 17 at the Blackbushe, Surrey and Belle Vue, Manchester auction centres. Each location will offer 250 convertibles in one auction hall, while the alternative sale will be streamed live into a second auction hall. Account card buyers who attend will be able to bid on all 500 convertibles on the day. There will also be Live Online bidding for buyers unable to travel to either location. Both sales will be open to the public, and every convertible offered will be covered by the BCA Assured programme, giving peace of mind to buyers by providing a report on a 30 point mechanical check carried out by an independent motoring organisation. Full details of the entry, including vehicle images and grades can be found by logging onto www.british-car-auctions.co.uk. The convertible sales will form the conclusion of a special ‘Double Triathlon’ Sales programme on Friday 16th and Saturday 17th March. Nearly 900 vehicles will be offered in simultaneous sales events at BCA Belle Vue Manchester and BCA Blackbushe, alongside an online ‘Bid Now’ sale of 50 convertibles which also runs over the Friday and Saturday. Robert Sturley, Southern Area Auction Manager for Lex Autolease said: “Lex Autolease leads the industry with remarketing initiatives and this event will be the first to offer convertibles at two locations simultaneously. Buyers will get every opportunity to bid on both the cars at their location and those 200 miles away, via streamed video on a big screen”. I wonder how would they divide 500 convertibles for 2 auctions. I just figured that vehicle auctions in sydney might be interested in this because they have sold a lot of convertibles in the past.